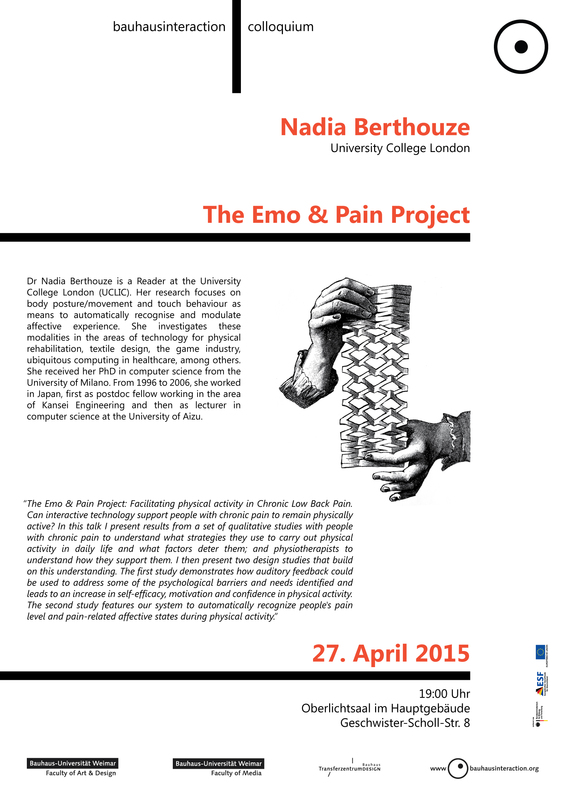 The first talk of the bauhausinteraction colloquium for this semester will be held by Nadia Berthouze. Also save the dates of the upcoming talks for spring/summer 2015! Dr. Nadia Berthouze is a Reader at the University College London Interaction Centre (UCLIC). Her research focuses on body posture/movement and touch behaviour as means to automatically recognise and modulate affective experience. She investigates these modalities in the areas of technology for physical rehabilitation, textile design, the game industry, ubiquitous computing in healthcare, among others. She received her PhD in computer science from the University of Milano. From 1996 to 2006, she worked in Japan, first as postdoc fellow working in the area of Kansei Engineering and then as lecturer in computer science at the University of Aizu. This talk is part of the Bauhausinteraction Colloquium. This entry was posted in Bauhausinteraction Colloquium, info, talks by gohlke. Bookmark the permalink.